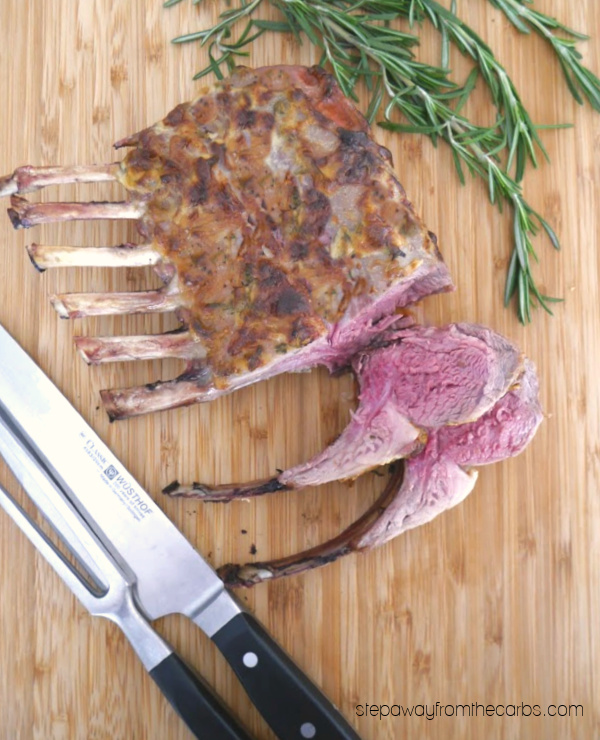 Cooking a rack of lamb is much easier than you might think! Here’s my method of preparing it! When I lived in the UK (yikes – nearly ten years ago!) I used to eat a lot more lamb. 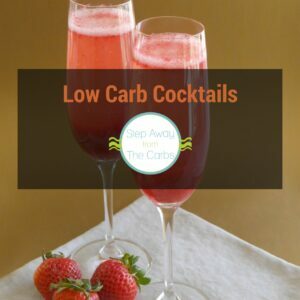 And although I do have some low carb lamb recipes on the blog, I really don’t have that many – mainly because it can be expensive, or I can’t find the cuts that I like. 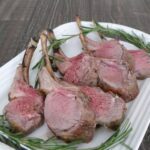 But when I saw a rack of lamb on sale recently, I jumped at the chance to enjoy it! I prepared it by giving it a simple coating of mayo, Dijon mustard and fresh rosemary. The flavors work perfectly with the lamb! The trickiest part is knowing how long to cook it for, and that’s where a probe thermometer comes in. Lamb is generally served on the pink side, but whether you prefer it rare (140F) or medium rare (145F) is up to you! I’m a rare meat kind of person – plus if you have leftovers I think they’re much better when cooked to rare. Season the lamb with salt and pepper, then combine the mayonnaise, Dijon mustard and finely chopped rosemary together in a bowl. Spread the mayo mixture over the lamb, and place it on a small baking sheet (this quarter size pan was perfect). 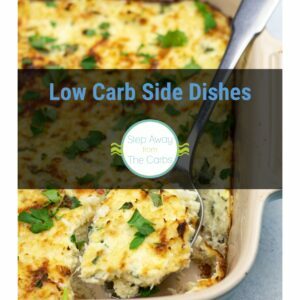 Roast in a preheated oven until cooked to your liking. Rare took about 20 minutes. Let the lamb rest for 10 minutes. Carve the lamb into separate sections, then serve. 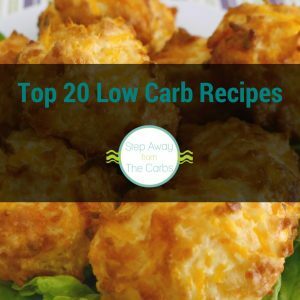 If you’re looking for some inspiration for what to serve with your rack of lamb, check out my huge list of low carb side dish recipes! 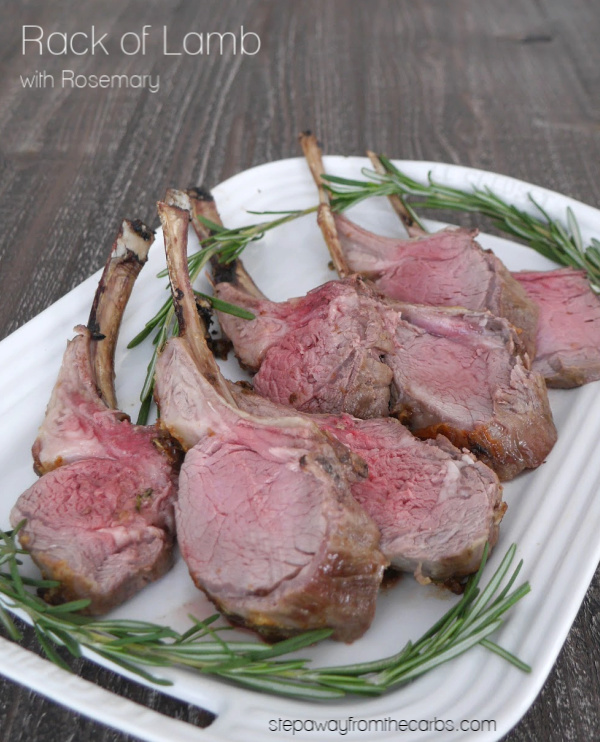 Cooking a rack of lamb is much easier than you might think! 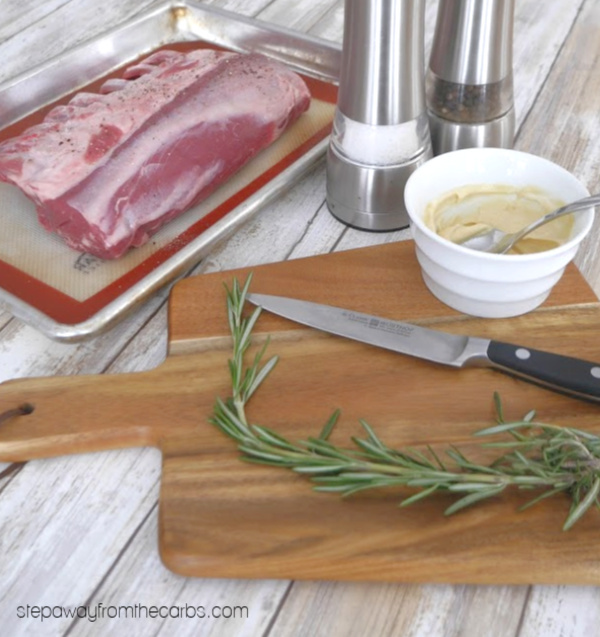 Here's my method of preparing it - with a delicious rosemary coating! 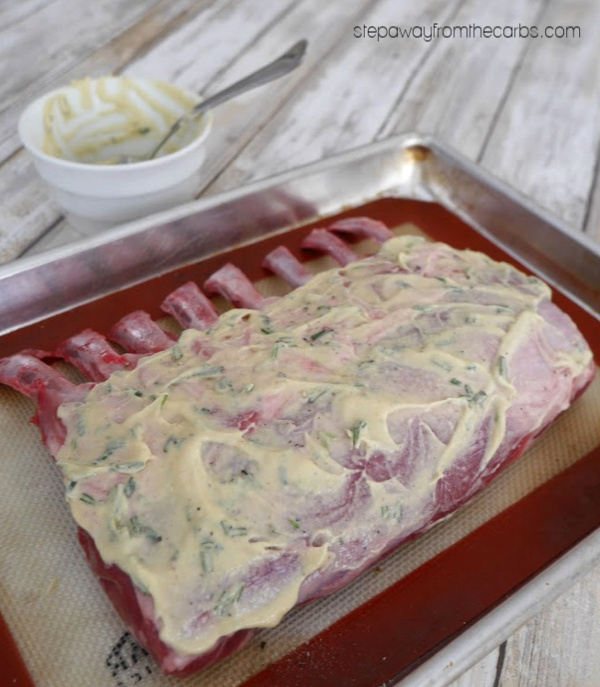 Season the lamb with salt and pepper, then combine the mayonnaise, Dijon mustard and rosemary together in a bowl. Spread the mayo mixture over the lamb, and place it on a small baking sheet. Roast until cooked to your liking (see notes). Let the lamb rest for 10 minutes. Lamb is generally served on the pink side, but whether you prefer it rare (140F) or medium rare (145F) is up to you! Use a probe thermomoter for the best cooking outcome.